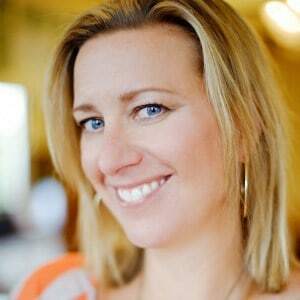 Today’s “a day in the life” is Heidi of FoodieCrush. I can’t even tell you how obsessed I am with Heidi’s blog, magazine, photos and now even her bathroom (keep reading, you’ll see). I also love Heidi’s generous nature and kindness to other bloggers. 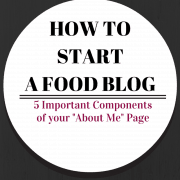 She often features other bloggers and shares posts that she enjoyed reading or recipes she wants to try. To get an idea of how amazing Heidi’s photography and recipes are, make sure to check out her Caramel Apple Brownies, Pickled Strawberry & Roasted Beet Salad, Stuffed Pork Chops with Roasted Grapes (love the photo of the uncooked pork! ), and White Bean and Pumpkin Pork Chili. But seriously, we’re just scratching the surface here. If she’s not already there, you need to add Heidi’s to the list of blogs that you stalk. You won’t regret it. As a traditional print magazine veteran and a fan of blogs, I found myself discovering and being inspired by amazing food blogging talent. I started FoodieCrush with the intention of creating an online magazine featuring food bloggers, their photography and recipes and telling their stories beyond their blogs. However, I quickly realized in order to have a magazine, and to get food bloggers to see I was even alive and agree to be in the magazine, I myself needed to create a blog. While I was being indecisive about whether to take a project like this on in addition to my full-time job and family, my husband one day wanted to make Pho. Proving my assumption that food blogs are the go-to spot when searching for a specific recipe, he trolled the internet and found a recipe from Steamy Kitchen (he was actually the one who turned me onto Jaden’s site), and made the soup. In the waning evening sunlight, I quickly snapped a few photos and boom! In April of 2011 I had the content for my first blog post. Originally I thought I could just feature food bloggers and their recipes but I quickly realized I had to create my own content in order to play in the blogger’s sandbox, which in turn created a segment of my business I hadn’t even anticipated: recipe development and photography jobs. Since then my life has changed dramatically. I’ve been able to quit my job and build FoodieCrush into a business, creating a whole new world of friendships and influences I had no idea existed before taking that first, uncertain step into the world of food blogging. 6-6:30 am: Wake up, check to see if the day’s scheduled post went live. Curse WordPress if it didn’t. Debate with myself about getting up to work out. Do so or slide back under the covers. 7 am: Get up, go get Smudge out of bed, snuggle for a few minutes and watch the Today show to see what crazy things have happened in Florida. Have you noticed the crazees are mostly centralized in Florida? Excepting the FL food bloggers, of course. 7:10 am: Shower, put on my face, pull my hair into a top knot. Even though I work from home, I can’t stand not getting ready for the day like I’m still going to an office. 8 am: Tag team with my husband to make Smudge breakfast, pack her lunch. He drinks a diet coke, I drink coffee and we eat a quick breakfast. Make my bed, do the dishes and vacuum up the dog hair before I can get started working. 9 am: To the computer I go, checking e-mail, tweet, peruse my Feedly feed. 10 am-noon-ish: Depends on the day and which projects are surrounding me, but I usually am: Creating and designing magazines, e-books, recipe development, research for blog posts, interviews, calls with clients, figuring out what I’ll be teaching my univ. students on Tuesday night. When I need to do some brainstorming I really enjoy going to the library or a coffee shop to give myself a different setting where I can keep focused and not feeling like I should change that batch of laundry. My friend Courtney and I try to do this at least 2 times a month, she’s a great motivator. Lunch: If my man is working from home we steal out for lunch, usually Vietnamese food, Pho, Korean or some other local ethnic spot before making a Costco run. If not, I might do a quick workout or just sit and think for a few minutes, a mini-mediation, before I make a simple lunch–usually a salad with lots of fresh veggies and a little tuna. 1-3:20 pm: Then I’m either back on the computer or this is the time of day I’m usually creating/photographing recipes for clients, blog the magazine. 3:20 pm: Pick up Smudge from school, hit the grocery store for an ingredient I forgot for said recipe I was working on. Smudge begs for a doughnut and I give in 50% of the time, then it’s homework/hangouts/practices for her, back to work for me. 6 pm: Start figuring out what’s for dinner. You’d think I’d be more on top of it since its what I’m doing all day. Not always the case. 7:30 pm: Eat dinner, catch up on the day. 8:30 pm: Back to the computer to do the next blog post or finish whatever I was working on and didn’t get to. I almost always leave my blog writing for the evening because when I was working full time that’s when I had to do it, so it’s become a habit. I have to remind myself that this is my job now, it’s okay to do my blogging during the daytime. 10:30 pm: Get into the hot tub for my every night, wind down ritual. My husband fills it for me every night because if he doesn’t I get impatient, turn the hot on too fast and end up with a cold tub, then complain about the so super cool “green” on demand-water heater we installed and am now emptying to re-fill. It’s just one way he shows he cares. 12:30 am: Catch up on DVR’d episodes of Parenthood, Louie, Up All Night and Portlandia (we don’t have HBO or Showtime so I’m missing all of the other good stuff.) If husband is asleep I covertly change to my guilty pleasure of Real Housewives anywhere: Beverly Hills, Atlanta, New Jersey, etc., Then it’s David Letterman. If I can’t go to sleep after Dave I turn on any taped episode of Barefoot Contessa and within 5 minutes my lids are at half mast and I catch myself mid-snore. My kitchen shears. I use them to cut anything and everything from herbs, to pizza, to pieces of french toast. 3:20 pm Monday through Thursday. That’s when I pick Smudge up from school. For 8 years my daughter was in daycare, with some very loving caregivers, while I worked. Knowing I have about 5 years left that she will still like me to become a skulky teen, it’s so important to me to connect with her now and build our relationship. It was the number one reason I invested so much energy into creating my own business so I could have that flexibility. When my daughter puts One Direction on the iPod and gets into the kitchen to help cook or clean up as she sings and struts about as if she was dancing on one of her favorite Disney episodes, telling me random little nuggets about her day. She is honestly one of the funniest people I know and loves making me laugh. Any time I have to do dishes or empty the dishwasher, which seems like every time I step into the kitchen. I will cook for anyone, just don’t ask me to do dishes. If you could choose one room in your house to spend the WHOLE day in, which room would it be? My bathroom. I could live in my tub forever. I’ll choose a beach vacation over a city vacation every day. My favorite has to be Koh Lanta in Krabi, Thailand, specifically Pimalai Resort. We stayed there in the most amazing beach villa for a week several years ago and it was fantastically magical. I’m still craving the breakfast sausage soup and fresh papaya with a squeeze of lime they served every morning. We’re planning a trip back in the next few years with Smudge. My grandma was full of amazing life quotes, but my favorite is, “Inch by inch, life’s a cinch. Mile by mile, it’s a trial.” She was one of the smartest women I know. Anything by Donna Hay, currently Seasons . However my go-to cookbook is Cook’s Illustrated’s The New Best Recipe . There are several that are stand-outs, not because of popularity, but because of sentimentality and the stories behind them. 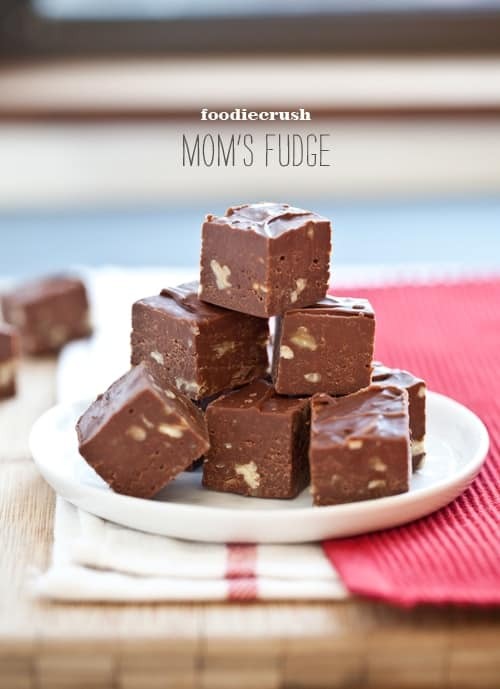 Probably my favorite is My Mom’s Fudge. It’s a recipe my grandma always made, my mom has always made, and I make with my daughter and now get to share with so many others thanks to the blog. 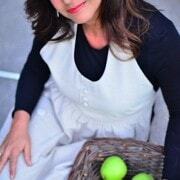 It was also a thank you post for the launch of my first issue of FoodieCrush magazine. It was a relief to have if finally out and in circulation. Pretty much anything with cheese or bacon are big hits. 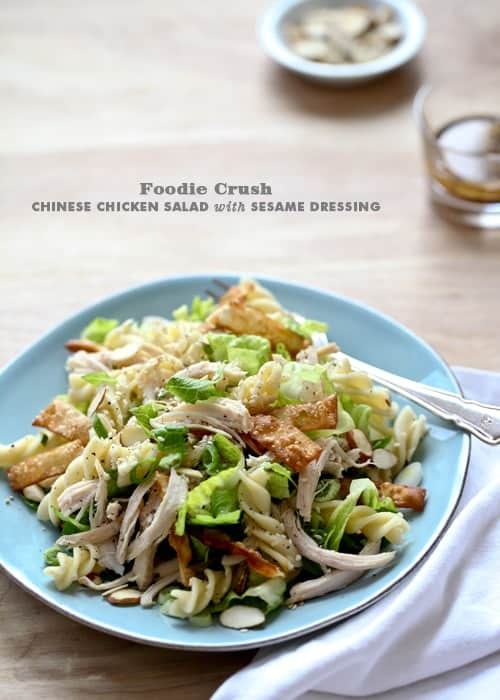 However, my recipe for Chinese Chicken Salad with Sesame Dressing is my most popular, thanks to a continued run on Pinterest. Creating new content in addition to my blogging, whether I’m making money from it or not, increases my readership every single time I create something new. I’ve found that each time I produce a new magazine or a new ecookbook, whether they’re money generators or not, my readership increases exponentially. This in turn leads to other, unanticipated income opportunities that I may not have been exposed to if I wasn’t creating new and unique content. It’s a lot of work, but it has totally paid off. My complaint is the same as every other blogger: Too much to do, not enough time to do it and the battle not to compare myself to others. It’s impossible to not feel deflated or disappointed if you don’t let go of a few things on your to-do list and live your life outside of the blogosphere. There’s a big world out there, get out and be present in it. When I started I felt like I needed to have everything in just the right place, in just the right order, with just the right tools before I could start. Which meant I created a self-dictated 6-month road block. If you want to start a blog, if you have a passion for telling others how to improve their lives and want to teach them how to do it, just start! Get that domain name, buy a wordpress template, throw up a logo and start posting. You can always change and refine as you learn. Even the best bloggers are continually growing or where would the fun be in it? Thanks, Heidi! I’m beyond impressed that you put on makeup every day. Also, I could live in your bathroom as well, but that might get weird. Find more of Heidi on Twitter, Facebook, Instagram, Google+ and Pinterest! Disclaimer: This post contains affiliate links. If you buy the cookbooks Heidi mentioned, I make about 2 cents. Typically, this money is put right back into the blog. WOW! I love ALL of your ‘day in the life’ posts, especially this one because Foodiecrush is SO AWESOME! thanks for all the awesome posts! Thanks! Isn’t Heidi the greatest? She totally is the greatest (she commented on a recipe I had made of hers-turned out so great and I was just over the moon excited that she actually commented and interacted with me!) You are the greatest too with all these awesome ‘Day in the Life ofs’ and totally awesome recipes! I can’t believe I only now came across your blog today, I’ll definitely be a super fan! 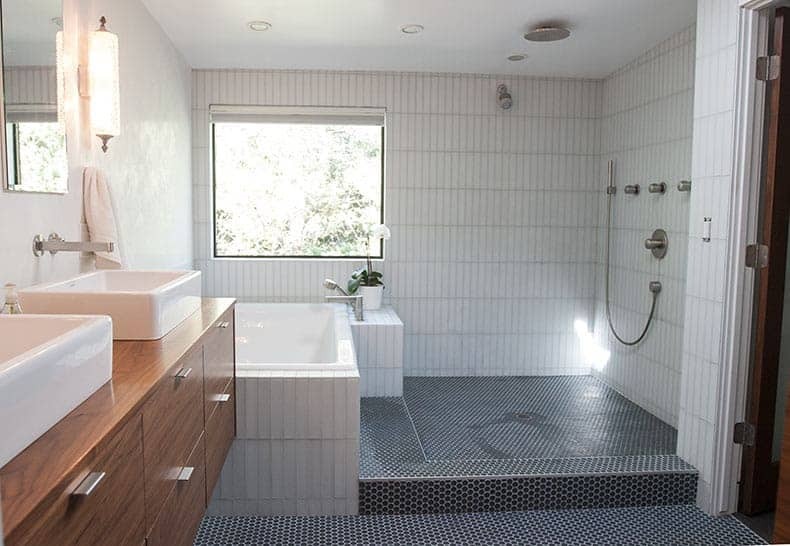 Heidi is amazing… um, and ya, so is her bathroom. I’d wanna live in the tub too! I love this feature, Rachel!! Heidi is a gem! LOVE Heidi! I met her at Mixed last year, and she is so sweet and so much fun. And….I want that tub. Can I just say that Heidi is one of my favorite people ever? Heidi is creative, beautiful, talented and funny. What more could you ask for, really? Pretty sure we’d be wine-drinking buddies if we were neighbors. And if you think her bathroom is amazing, you should see the rest of her house. Amazing space she has created. Obsessing over her bathroom… so.stinking.jealous. Fabulous post! I am a HUGE foodie crush fan. Heidi is truly amazing. Thanks for letting us take a walk in your shoes for a day Heidi!! Such a wonderful interview! I am so happy to call Heidi one of my blogging friends and she truly is one of the most genuine people you will ever meet. And her talent is off the charts! Love Heidi! 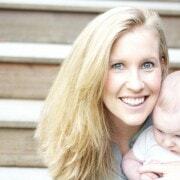 Great feature and so great to learn more about you, Heidi! That bathroom is gorgeous!!! I would never ever leave that bathroom! Ha–I do it better than you? Yeah, okay, Heidi…surrrrre. uhhhhhhhh that’s your BATHROOM?! holy cow. i would live in there too! check out that ginormous shower!! i love heidi! i had the opportunity to meet her at Mixed this past november and she was a DOLL! Ok, I see why you want to live in your bathroom! Great interview! That bathroom is incredible!! I have some serious green eyed monsters going on over here. This was a really thought provoking read. Heidi is one of those special people that brightens any rooms she walks into. Her energy is infectious and she is truly one of the most giving, selfless people I know. Love that you featured her here today! Love you Kelley. Becoming friends with you is definitely one of the best rewards I’ve received from blogging. Love you roomie. Absolutely love this! And Heidi. And that bathroom whaaaaat. Great insight into Heidi’s life! Does that shower double up as a parking spot…huge!!! Great interview Rachel! Heidi is amazing,I don’t know how she gets it all done and has time to put on make up everyday! Heidi is truly one of my favorite people. She’s off-the-charts talented, generous in every way and better than anyone I know at sparking conversations in a group of people. Loved this! I love love love these posts! I’m always curious about what a “day in the life” looks like for a full time blogger. I can dream that someday that will be me! Oh wow. That bathroom is amazing! I agree with Rachel; very impressed you put makeup on everyday!